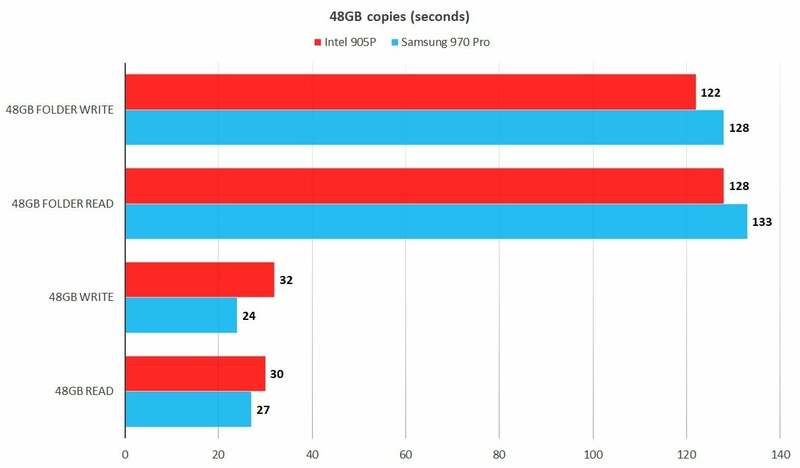 Faster with small files and multiple threads and queues, and far longer-lived than Samsung's 970 Pro, this SSD is also well beyond most user's budgets. Intel’s Optane SSD 905P is a follow-on to the Intel Optane SSD 900P we reviewed earlier this year. If you read that review, you already know about the ridiculously long claimed lifespan of Intel’s Optane memory. I'm talking petabytes written rather than terabytes regular NAND SSDs claim. 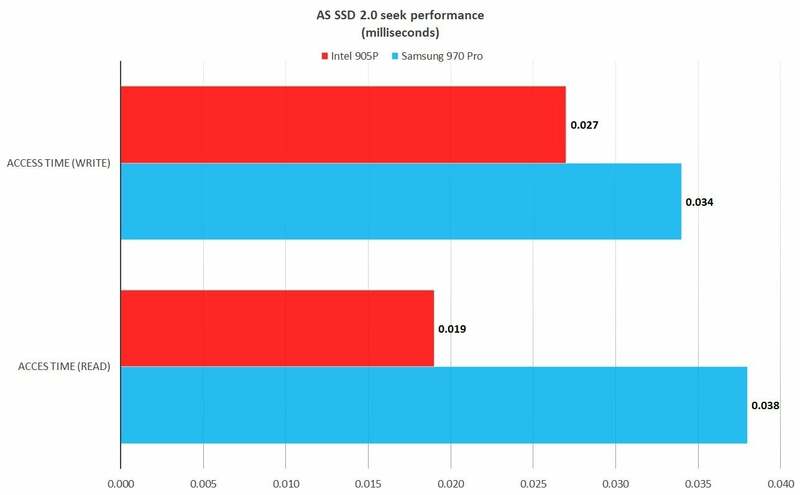 The 905P is also faster than the 900P and beats the pants off of any single M.2 PCIe/NVMe drive in threaded and small file performance. The downside? It’s really, really expensive. Before I get to the specs, more on that price. The 960GB PCIe 3.0, x4 add-in card version of the 905P that I tested has a list price of a cool $1,300. The 1TB Samsung 970 Pro, a most worthy drive in its own right, costs less than $400. There are other versions of the 905P, namely a lower-capacity 480GB (available on AmazonRemove non-product link) and a higher-capacity 1.5GB (list price $2,200), though I couldn’t find the latter online. All three capacities are also available (or will be) in a 2.5-inch form factor with a U.2 interface (formerly known as SFF-8639) with an adapter cable that runs to your m.2 slot. Also announced is a M.2/22110 (22 mm wide, 110 mm long) 380 GB version of the drive that won’t be available until November 2018. 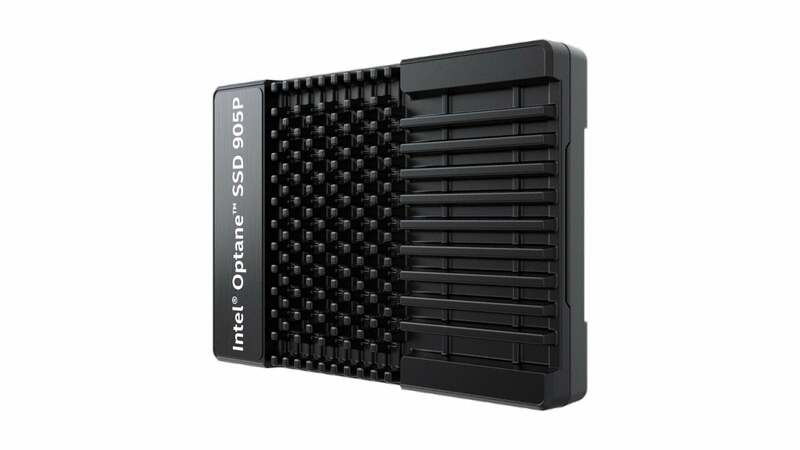 The 905P uses Intel’s Optane non-volatile memory on board, which in turn uses the NVMe protocol for passing data back and forth with your computer. 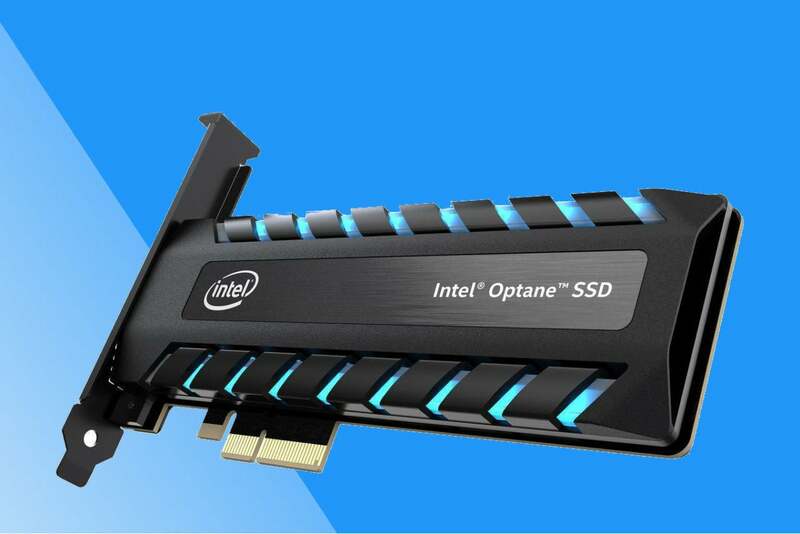 There’s not a lot we can tell you about Optane, other than it uses the company’s 3D XPoint technology. Intel is mum as to the technical details. As the 2.5-inch and M.2 Optane drives we’ve tested so far are fast readers, but mediocre (for NVMe) writers, we assume that Intel is using some sort of RAID or other trickery to increase the 905P’s write performance. We tested only the 960GB version, and the performance of the smaller capacities might not be as fast. There’s a large, finned, black heat sink covering the entire board, as well as blue LED lighting. The drive carries a 5-year warranty, however, that’s voided if used in a “multi-user, multi-CPU, data center environment.” Okay. Though it’s not quite as fast as the Samsung 970 Pro when it comes to sustained throughput, the 905P absolutely rocks when it comes to multi-threaded, multi-queued performance. 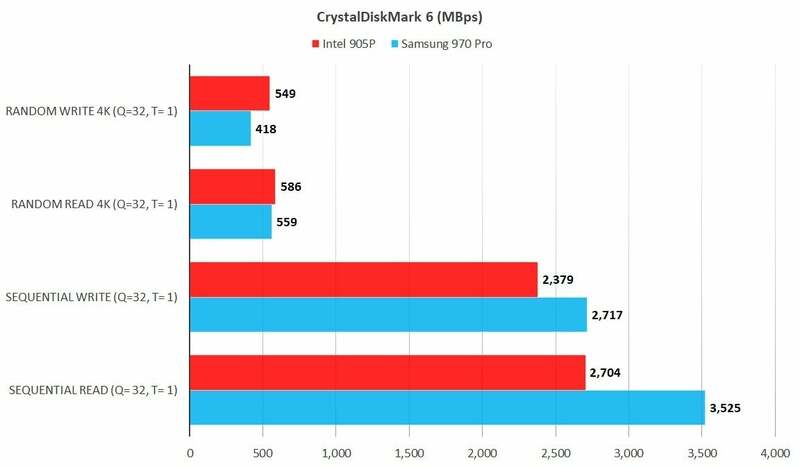 Below are the CrystalDiskMark numbers (the Intel 905P is in red, the Samsung 970 Pro, blue). Impressive. Random write is small file performance, sequential is large file or sustained write performance. CrystalDiskMark rated the Intel 905P as slower than the Samsung 970 Pro in terms of sustained throughput, but faster with smaller files. Small file performance is very important when it comes to the feel of your operating system and on servers fulfilling lots of file requests. Both drives are very fast. 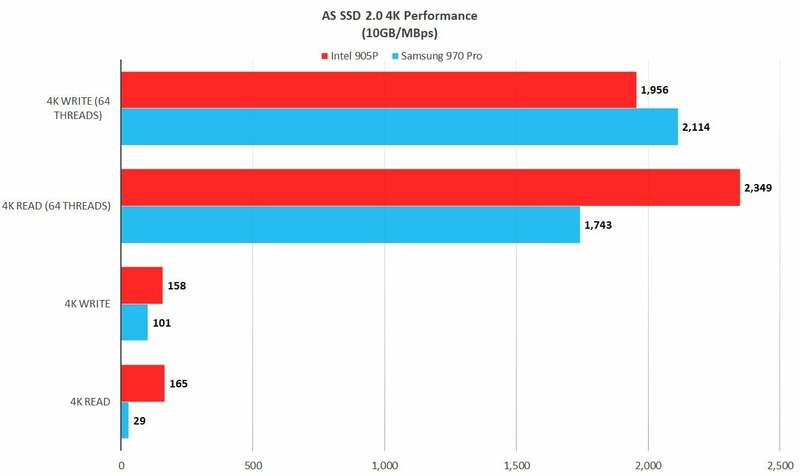 AS SSD rated the 905P as slower than the Samsung 970 Pro in sustained throughput, and this test is far more sanguine about the actual speeds. Longer bars are better. The 905P is in red. 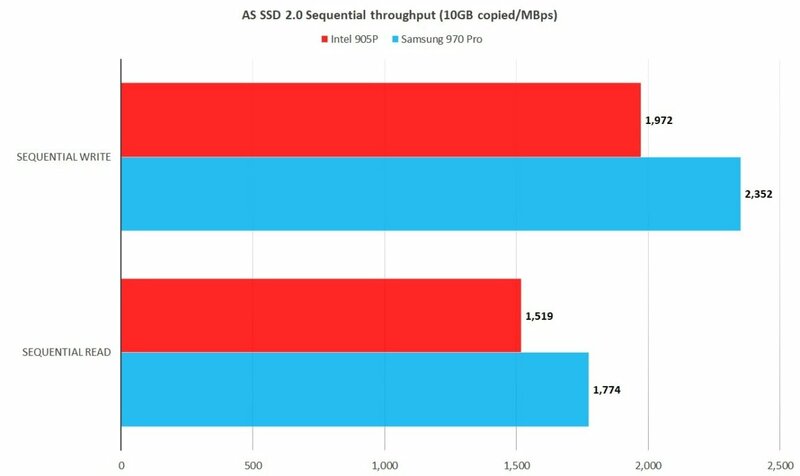 On the other hand, AS SSD showed the 905P can locate files far quicker (seek) and handle small files significantly better than the Samsung 970 Pro. We normally don’t show seek times as they’re usually pretty even, but the 905P was considerably faster over about 10 iterations of the test. In most 4K (four kilobyte data chunks) tests, the 905P dominated the Samsung 970 Pro. Longer bars are better. Our copy tests also showed that the 905P was a bit slower than the 970 Pro with sustained throughput, but faster with our 48GB group of smaller files and folders. Both drives are very fast, but the 905P will come into its own in multi-access situations. The Intel 905P is slightly slower than the Samsung 970 Pro with the large files, but faster with groups of files and folders is the Intel 905P. If money weren’t an issue, the Intel 905P is the drive I’d use in my system. The performance is great, and the promised longevity parlays into a sense of security other drives don’t quite provide. It’s quite simply the best thing out there. But in the real world, where people actually work for money, I would have to say “Nay, nay...” It’s debatable whether even the 970 Pro is worth the money when there are very fast alternatives, such as WD’s NVMe Black available for $100 less. The Intel SSD 905P is one of the fastest NVMe drives we've tested, and one of the most expensive. But that's because it's rated to be very durable. If you write a lot of data, that's a selling point worth considering.